Trust you’re all enjoying the summer, as I am. 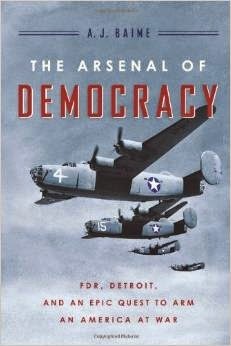 Reading The Arsenal of Democracy, A. J. Baime’s splendid account of how Detroit answered President Roosevelt’s call for weaponry to combat the Axis Powers. In 1941, as Hitler’s threat loomed ever larger, President Roosevelt realized he needed weaponry to fight the Nazis—most important, airplanes—and he needed them fast. The Arsenal of Democracy tells the story of how Detroit answered the call, centering on Henry Ford and his son, Edsel, a troubled visionary at odds with his increasingly cruel and paranoid father. Critics jeered: Ford can’t make planes; they make simple, affordable cars! Bucking his father’s resistance, Edsel charged ahead. Ford would apply assembly-line production to the American military’s largest, fastest, most destructive bomber. And eventually they would help the Allies win the war. Edsel emerges as a tragic, Gatsby-like figure hounded to his death by the sadistic, and possibly demented Henry. Henry’s paranoia and cruelty in his later years are in sharp contrast to his earlier energy, creativity and philanthropy. He remains the pride and sorrow of American manufacturing. The same words apply to Edsel, though for different reasons. Mass production and the Ford System, revolutionary at the time, were crucial to the Allied victory. Without Edsel’s vision and drive the war might have dragged on for years. Ironically, a generation later, the Ford system was obsolesced by Toyota and other challengers. ‘T was ever thus. Each generation challenges the achievements of the last. We lost Edsel in his prime to stomach cancer. Was it linked to Henry’s continuous abuse? I can’t help wondering: What if Edsel have lived? Would the Ford system have evolved quicker and been better able to meet the Toyota challenge? Sadly, we’ll never know. But it’s good to see Edsel Ford get due recognition. A splendid, talented and generous man, dealt a difficult hand, he played his cards with courage and vision. Edsel Ford is one of WWII’s unsung heroes.